Pros: A pacey, modern production with plenty of humour and excellent comic moments. There is a lot of really enjoyable character interpretation, which adds a colour and relevance to the script. Cons: In delivering the prose in modern voice and comic character, at times the diction was unclear and parts of the story were lost. The blind casting worked better for some characters than for others. Our Verdict: A very enjoyable version of this play, with lots of humour. The interpretation makes it relevant and accessible, giving it wide audience appeal. I’d not seen this particular Shakespeare play before and I always look forward to a bit of the Bard as there’s always a good story to be told. This one is no exception – the King of Navarre decides to get his three closest knights to pledge to go without wine, women and song for three years in pursuit of greater knowledge in education. They reluctantly agree, but it all goes to pot when a French princess and her consort of ladies visit the King. Throw in some riddle-some serfs, some mistaken identity and a rather flamboyant Spaniard lamenting the unrequited love of a wench, and you have ample action and opportunity for laughs, which this production exploits to full effect. Grassroots Shakespeare London certainly know how to deliver a play with relevance. The modern setting and contemporary interpretation of the production is very appealing and entertaining – the King and his knights are Oxbridge types, the ladies similarly Sloaney, the servants ‘wheeler-dealers’ and the Spanish swordsman is, well, just hilarious! I love the use of regional accents to bring personality to the characters, and there is an abundance of humorous parody to keep the laughs readily rolling. The contemporary voice lends itself nicely to making the story accessible and is to be applauded. The cast are very comfortable in their roles but this does lead to some loss in diction and there are times when the prose is not clearly decipherable. For example, I am still unclear why the two scholars Holofernes and Nathaniel take the stage, as, although very entertaining and hilarious, I barely caught a word they said! Interestingly, Grassroots is an ‘original practices’ theatre company. This impacts the production in two ways: casting is gender blind and there is no director; the cast work collaboratively to create the piece. The latter works very well, as not only is the lack of a director not evident, but I think the direction is excellent in the small space with few props at the Old Red Lion. Gender blind casting, however, is a bit hit and miss – I feel it is effective in generating humour, however, in the straight roles it has the opposite impact. I found some of the cross gender performances bland which undermined the success of the overall production, particularly when it pertained to central roles. The cast are marvellous, particularly bearing in mind they are often playing more than one role, performing another play (Romeo and Juliet) in rep with this one and directing themselves as well. There are a few stand out performances, notably Robert Nairne as Don Adriano. Nairne’s panto like spoof is just fantastic and he has the audience bellowing with laughter from the instant he steps foot on stage. He works so well with Matthew Cavendish playing his page, Moth, the two of them providing the perfect comic double act. Also enjoyable is James Swanton who shows real breadth in his performance of the demure lady in waiting Katherine, which contrasts strikingly with his portrayal of the eccentric and comical hunchbacked Holofernes. James has a unique, interpretive talent that is rather mesmerising to watch. Alec Parkinson plays the debonair, doubting Berowne with finesse and Boris Mitkov delivers the riddle-ridden Costard with energy and jovial conviction. The Old Red Lion is nice and easy to get to and is a spacious, friendly pub with a small outside seating area perfect for a summer evening. Whilst they have air conditioning installed in the theatre space, they really could make better use of it by ramping it up a little before the performance to ensure that the atmosphere stays comfortable throughout – when I attended on a surprisingly warm summer’s evening, it got airless and uncomfortable in the audience and the cast appeared to be sweltering too. That said, this is a very enjoyable production! 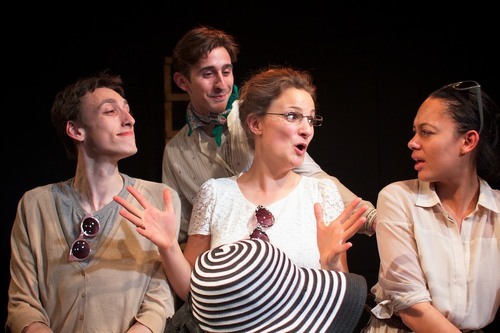 Love’s Labour’s Lost runs at The Old Red Lion Theatre until 27th July 2013.